Bubba Kush is a productive, 75% indica, plant that was created through crossing OG Kush with Chemdawg. Bubba Kush Feminized Cannabis Seeds by The Plant Organic Seeds: Bubba Kush is a productive, 75% indica, plant that was created through crossing OG Kush with Chemdawg. It has a compact structure and surprisingly high yields in a relatively short flowering time. 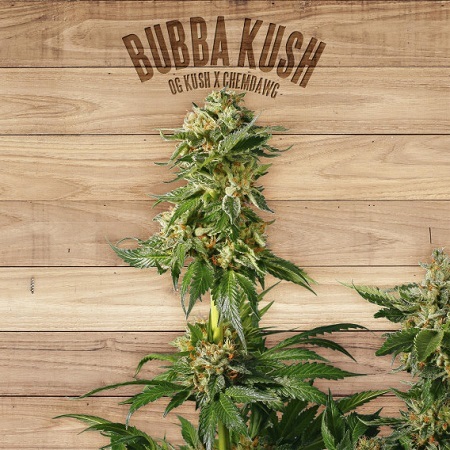 Bubba Kush grows to a height of approximately 100 - 120 cm. and sports very dense buds, ranging in colour from mid-green through to purple, which will require effective humidity control if the buds are not to develop grey rot. Resin production is very high making it an ideal cannabis strain with which to produce a variety of extracts. Indoor growers should be able to harvest between 450 - 550 gr/m2 in an 8 week flowering period while outdoor harvests will be ready during October in northern latitudes. This precludes regions where there are likely to be early autumn rains as this will compromise mould resistance. The size of the harvest is likely to be 550 - 650 gr/m2 in this environment. This strain bears an earthy, licorice type of aroma somewhat at variance with the taste of sweet, fresh fruit. THC levels are high at 15.33% with low CBD of 0.1%. The effect is very relaxing with a marked sleepiness making it a great choice for those suffering with insomnia and also people with symptoms of pain.